…and we’re back in pants. September 2018 was another tough year in the world of fundraising. With massive storms leaving some of our strongest fundraisers and sponsors in harm’s way we had to rely on some new comers as well as some who have been around a few times, sniffing at third place. Also, our Kilt sponsor Damn Near Kilt’em stepped up HUGE. The online fund raising contest has closed. All that remains is to make sure the snail mail has time to reach us and we need confirmation of any Facebook or third party fundraising efforts. We used to be able to just have a look-see from our end but that functionality has been disabled. 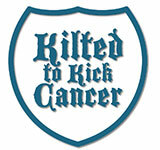 If you did a Facebook fundraiser for KTKC, shoot a screenshot of your total to justin@kiltedtokickcancer.org before the end of the week and I’ll add the totals in. Winners will be announced early next week! We’re also branching out and planning events for other months of the year, including a Zero Cancer race in November that will feature KTKC as the MCs. What could possibly go wrong? We did a good job this year, let’s make it better next year!